Our new mast base plate is larger than our mast step, so we reshaped it to the correct size and shape. I sanded off the paint down to bare glass/gelcoat. During this process hairline cracks revealed themselves in the cabin top gelcoat, starboard of the step. This is the side that had taken the strain when the boat was dismasted, and it was slightly depressed back when the mast was on the boat. At that time (and currently) the boat had no interior cabin roof support structure to the starboard bulkhead. So AJ decided we should reinforce the spiderweb-cracked area, not just build up the step. 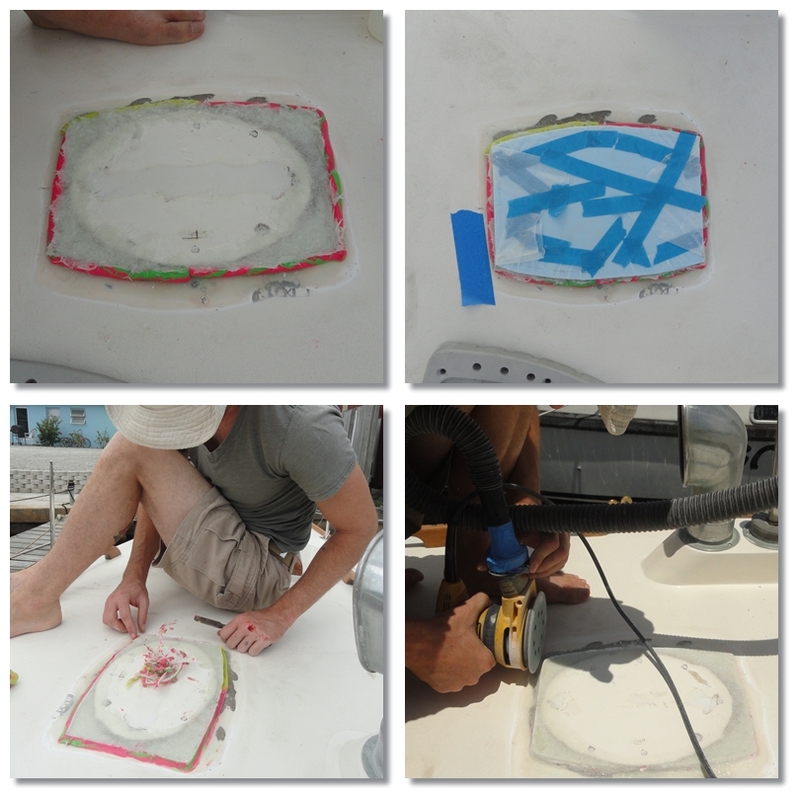 We laid two layers of biax around the mast step, sanding out and then covering the cracks. After that had cured and was sanded fair, we built a dam out of modeling clay in the shape of the new step. The dam was filled with chop strand fiberglass and epoxy. 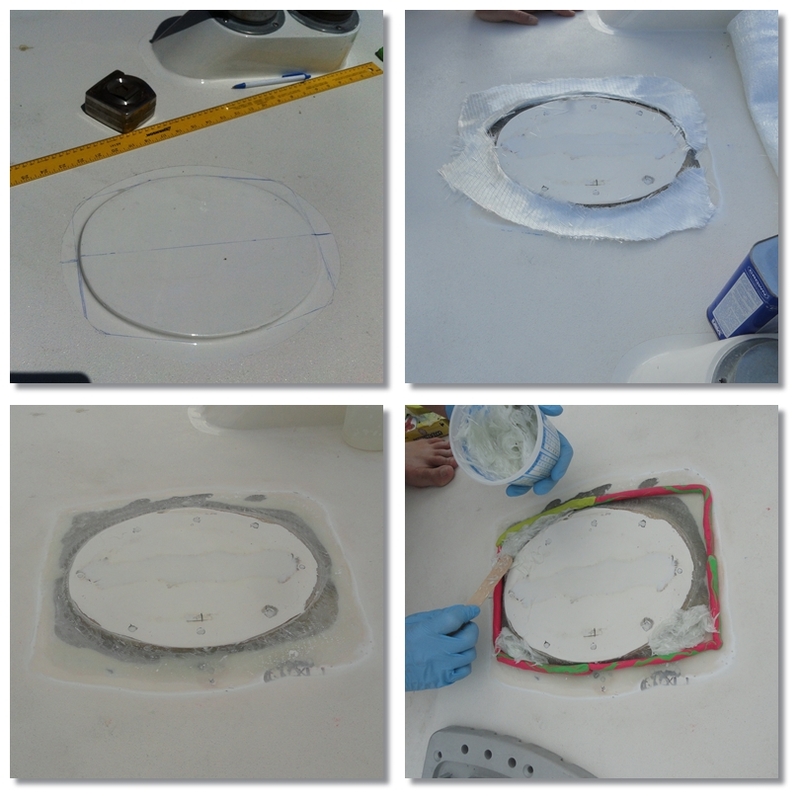 To press out the excess resin and air, and to ensure a flat final surface, we placed a lid on top: Foam cut to shape and wrapped in wax paper so it doesn't stick. Now all it needs is paint! We are making good headway on our 9 day list. (Now in Checklist to Launch). But as expected there are a few hick-ups. Today it's dumping rain... and that is supposed to continue through the week... and we're still waiting on a few key components to move forward with rigging. But the stay wires are cut and we've begun terminating them with what fittings we can. We also built the mast support blocks (the ones at the keel end), and they are ready for final fitting and assembly. It's been a little of this, a little of that, so that when we get the missing pieces, hopefully the puzzle can be solved quickly. Just found your site through the blognation and was delighted to have found another couple getting into similarly serious projects. We will read some of your archives at a later date but for now we must get on; We raised our mast yesterday and need to get a zillion jobs done before we finally set sail in two or three weeks. We've spent 18 months working on her full time, mostly on the hard so it feels great to be about to finally leave Texas and be at home aboard. Good luck for your own stepping. Thanks Ruth and Duncan! I checked out your blog, and added it to our blog list. Incredible work! It is nice to look through and all the see similar projects. Congrats on moving aboard! We're a few steps behind you, and can't wait for that day! Your narrow boats are awesome btw.